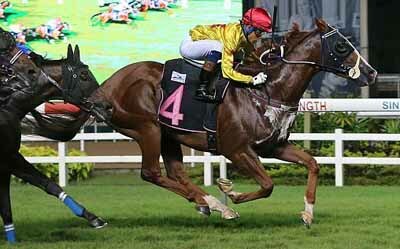 Placed in his first three runs over shorter trips since coming to Singapore, SUN MARSHAL broke through for his first win here in the Kranji Stakes C event over 2000m tonight. Apprentice Rosman Iskandar, who was partnering him in races for the first time, sent him to the front on settling down and the Sepoy gelding made all the running and held off all challengers to win by three-quarter length. "I wished the Derby could be a 2000m race, but he showed his qualities and his toughness to win a race. He beat a very good field," said trainer Lee Freedman of the win. SUN MARSHAL, a A$200,000 yearling purchase, has been consistent throughout his career. In nine runs in Australia, he was only out of the board once. He won two races at three, over 1600m at Ballarat and 2000m at Caulfield, and was placed second the Group 3 Grand Prix at Doomben and third in the listed Galilee Series Final (2400m) at Caulfield.